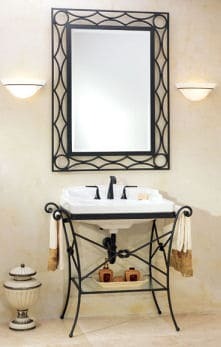 If you have a small bathroom, and planning to remodel or upgrade it, think vanity consoles as they offer a few benefits. 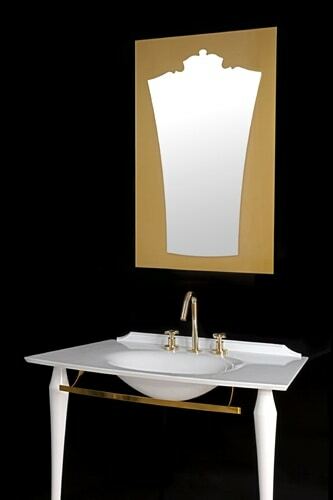 Space saving abilities is the number one selling point for the vanity consoles. The open space under a sink is a perfect place to add extra storage where you can keep your bath products in stylish baskets. Consoles are also easy to clean. 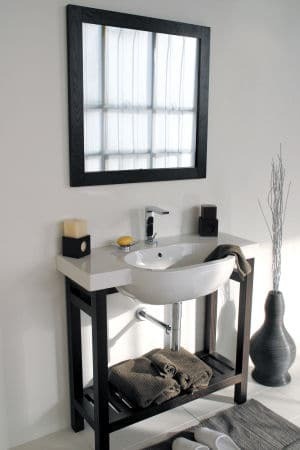 A vanity with no walls lets you clean it thoroughly with ease. 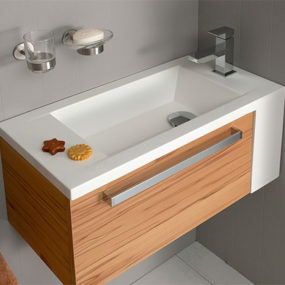 In addition, console sinks come in so many styles, you can easily find one that fits your bathroom. Speaking the design variety, we’ve gathered a few popular consoles of every style, from modern to vintage, from art deco to industrial. Read on for sources. 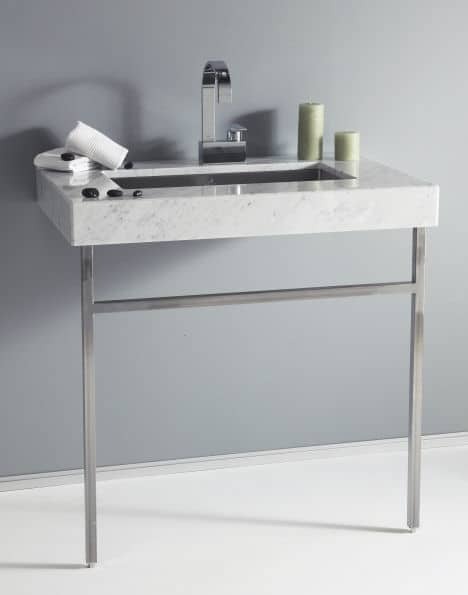 A slim under-mounted sink that fits into a lovely white Carrera Marble vanity, the offers a simple and elegant accent for sophisticated bathrooms. 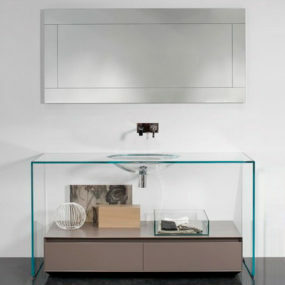 A rectangular form, the console has a sense of space and openness that makes rooms appear less crowded. Available in wall-mount or freestanding styles, it looks light and airy, even when balanced on narrow spindly legs. Beneath a gorgeous marble surface rests a stainless steel sink with sharp clean lines. The steel and Carrera Marble (as in model 502355 shown) are a wonderful marriage of light materials in contrasting textures, for a modern indulgence and design. An alluring bathroom furnishing, the Julien console uses the natural beauty of marble to create a stunning vanity for modern interiors. 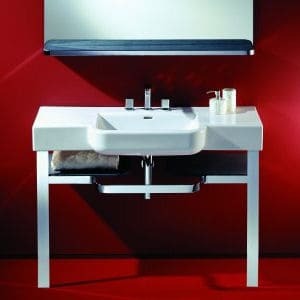 The clean profile of the City vanity console from Urban Archaeology can give a modern bathroom some edgy flair. It combines the luxury of marble with the sleek flavor of metal to produce a contemporary fixture that has major attitude. This stylish unit features a thin, white marble slab into which the sink has been recessed. This slab seems to virtually float while perched atop thin metal legs, giving it a somewhat hi-tech appearance. Nevertheless, it seems to maintain a sense of classic styling that gives it some credibility as a functional and elegant piece of furniture that would be equally perfect for the traditional, transitional, or contemporary space. This console is a standard 24″ deep, is available in various widths, and comes in a two or three leg version. Pricing and other info can be obtained from . 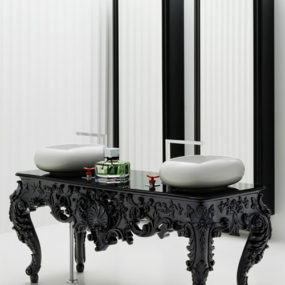 Pure white tops with distinguishing decorative flourishes are found in the collection of Ameli vanity consoles at Tulli Zuccari. 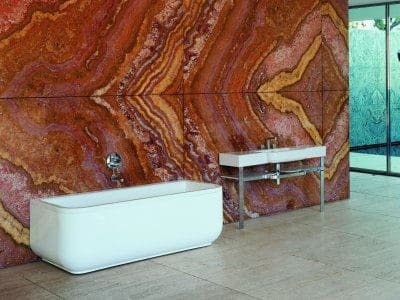 A curious and striking design, it would blend seamlessly into your art deco or classic bathroom. 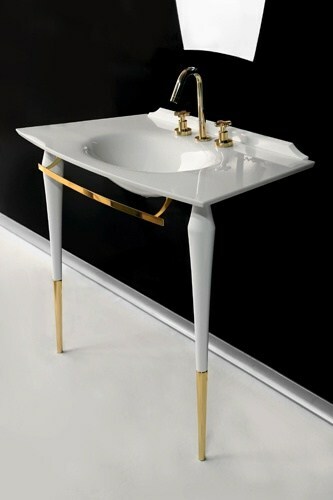 The vanity sits atop two immaculate legs – gracefully curved and beautifully teamed with gold or silver. Offering a glossy or satin finish, the top is available in sparkling white. The gold or silver bar extending from the top is unexpected, giving the console sculptural glamor. Ameli comes complete with your choice of limited-edition, specially crafted mirrors (which can include fine detail etched in 24-karat gold leaf) and is available from . A simple slab of stone balanced on thin brushed steel legs, the console offers a contemporary sophistication. The solid black stone forms a dark countertop on the brilliant and bright brushed steel unit. 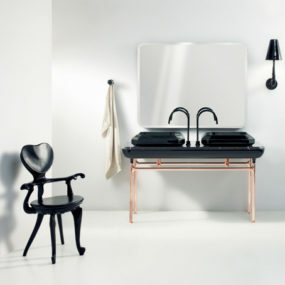 The four slender legs support a light slatted steel shelf and simple towel rails. 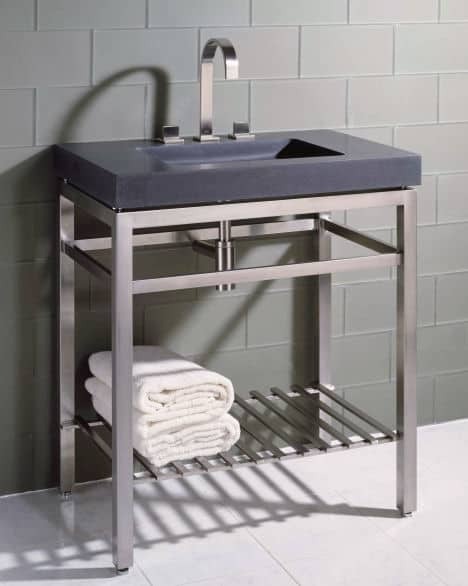 A functional open unit with clean lines and wonderful textures, the Stone Forest console offers useful storage space and practicality for a contemporary bathroom. High quality material comes into its own in the Capricorn stone vanity from , made entirely from stunning Steinbock slate. Fine craftsmanship is required to etch the double sinks into the solid block of stone; this method also serves to quietly emphasize the superior grain of the slate. Strong like those born under its sign, Capricorn vanity provides hard-wearing beauty. Easy to coordinate with any contemporary interior, its rectilinear form is tranquil and simple. This is a console that will stand firm with a Zen-like simplicity no matter what the world may throw at it. Whether you prefer a free-standing or wall mounted unit, with wooden drawers or without, Capricorn by Maxim makes a durable and unique selection. Marlene (above), a single sink console inspired by the designs of the sixteenth century but with a modern twist, is one of the most beautiful vintage bathroom consoles on the market, from Devon & Devon. They also offer a mirror named Amelie, designed in a matching vintage style. 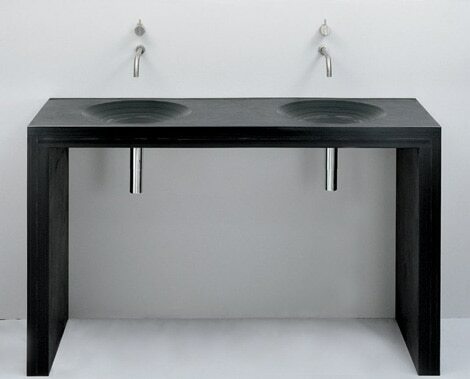 See more details about these sink consoles. The Form console from is a nice contemporary design. And it comes with a very functional form, thus the name. Let’s say you have a very narrow bathroom, and the space between the wall and the door opening is tiny. Thanks to the fact that the counter is much more narrow on both ends (vs. the sink depth), you could still fit this vanity in between, without hitting it when walking into the bathroom. Still, the built-in sink is quite large, which makes this design a win-win when you’re limited in choices. 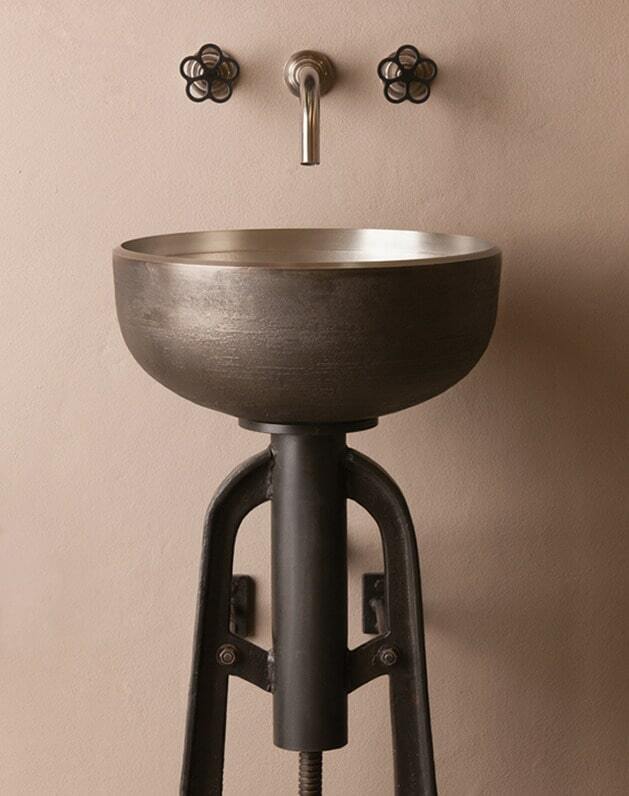 The Ore industrial style sink console from Stone Forest is a work of art. A metal, bowl-shaped vessel is mount over an industrial pedestal. This combination looks antique and very sophisticated, a perfect choice for a vintage themed loft. 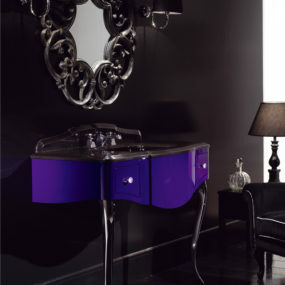 This stylish console vanity is available at . It’s a contemporary fixture that would make any bathroom decor more refined. A white porcelain sink extends on both sides to create an ample amount of counter space for your bathroom essentials. 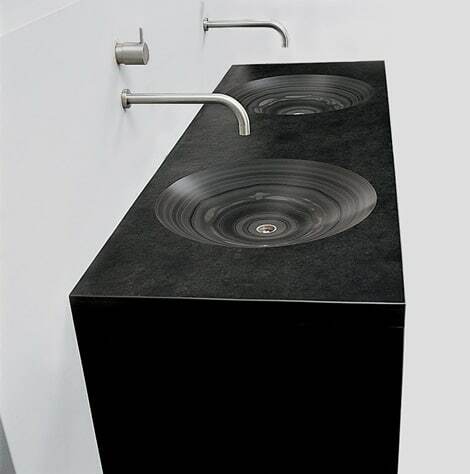 The sink is 39 1/2″ wide and is available in one or three hole versions. The wood stand is composed of solid oak stained with a dark wenge finish, creating a dramatic contrast with its white porcelain counterpart. The base also has a handy shelf, ideal for storing towels and washcloths. The unit features simple, elegant lines that add a bit of sophistication to any room. A matching framed mirror is also available. The is the complimentary vanity to the Orleans tub from St.Thomas Creations. 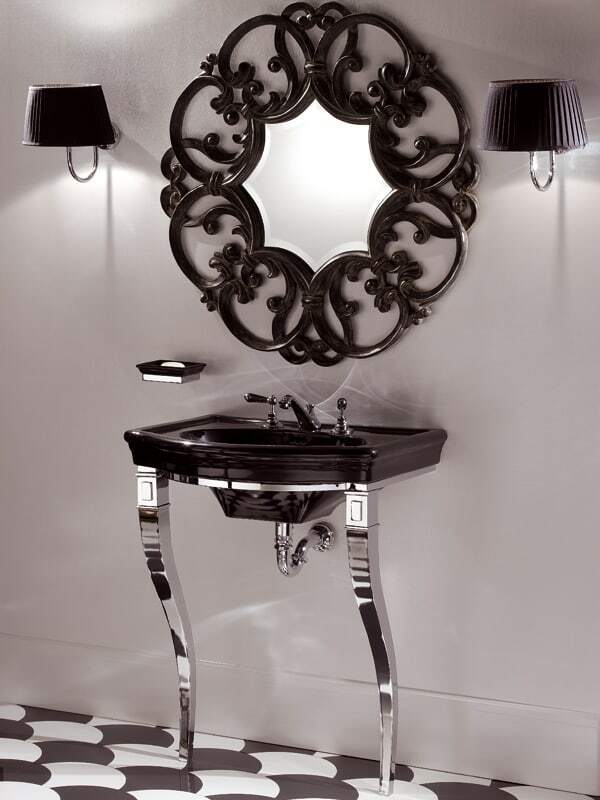 The white sink is situated on top of a delicately shaped wrought iron stand. The fixture has a sort of provincial French and Italian influence. It is available with 6 finish options. It also comes with the 5 year warranty. This piece is available in 2 sizes. You can order it in either a 37.5″ wide or the 34″ wide. 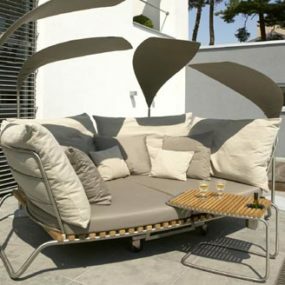 Price range is $1095 – $1415. 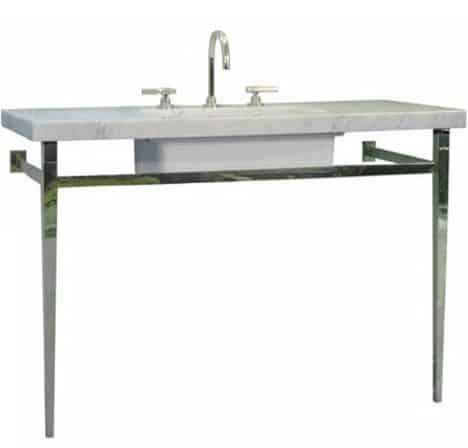 The super modern is made from recycled stainless steel and comes with an integrated countertop and basin. 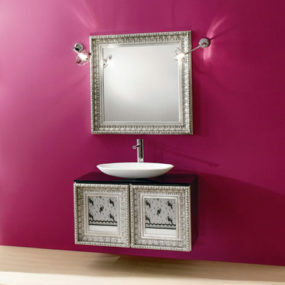 It can be customized to include storage shelves, drawers and a towel bar, to become a fully functional vanity. The solid surface countertop is made from a polymer bio-resin called Corterra that uses a minimum of 15% post-consumer recycled material and a minimum 5% rapidly renewable material derived from bio-based sources. 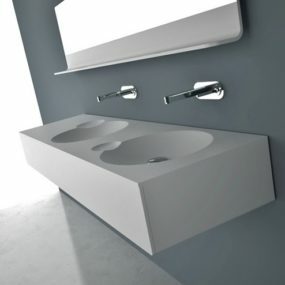 The location and shape of the basin can also be customized. 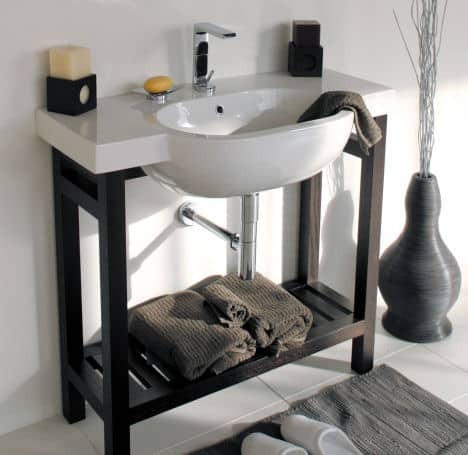 If space saving is your priority or you need to decorate a small bathroom then you may want to check out our selection of modern washstands and freestanding washbasins.